Master farrier, Hans Wiza, explains how the angle of your horse’s hooves affects the mechanics of his stride and posture. One of the most hotly debated and contested topics pertaining to hoof care is the so-called ‘correct hoof angle.’ Oftentimes, people will let traditional depictions or beliefs shape their thinking, not realizing that the same hoof angles can produce multiple postural stances. There are, in fact, a number of factors which determine the hoof angle for each horse, and simply assigning a numeric value is not indicative of good posture. Sometime in the previous century, someone assigned a numeric value to the angle of the toe as a reference point for farriers. This may have been useful for horses being shod by different farriers, but, generally, unless a farrierwas previously acquainted with the horse, this value was somewhat arbitrary and often not even pertinent on the day it was assigned. 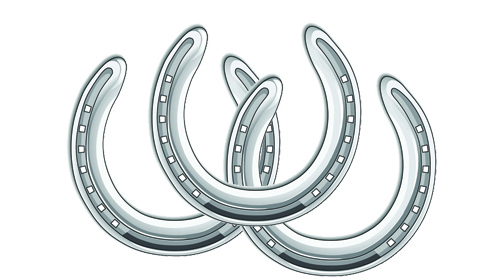 Several other elements needed to be taken into consideration, as hoof angles are as varied as the horses that have them. We have been taught that the toe ought to be parallel to the pastern angle, and that the pastern ought to be parallel to the scapula. This is not always correct, however, because pastern and hoof angles are quite variable. There is no such thing as a standard angle for any pastern, nor is there a standard angle for any hoof wall. Hoof angles can also differ due to the shape of the wall at the toe. A straight wall, for example, may read the same as a concave wall or a convex wall when, in reality, they each have different mechanical functions. This is due mainly to the imperfect way in which these measurements are taken. 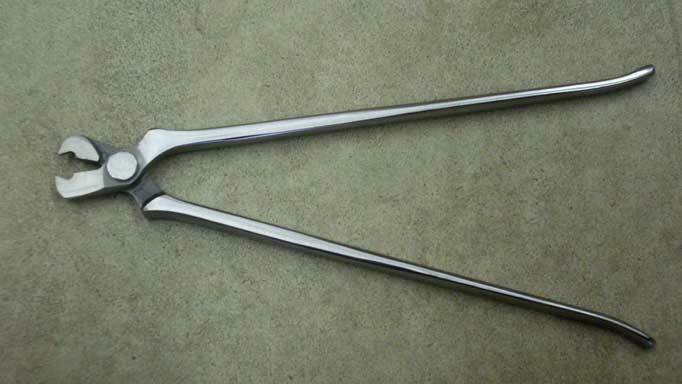 Hoof gauges – often a crude moveable protractor design – are notoriously inaccurate, as they can be manipulated in numerous ways, making it possible for there to be several different readings from the same foot. A hoof wall that has been heavily rasped, especially one that has been “over processed” (filed from the coronary band down to the ground surface), will also give a distorted reading, and cannot give a true indication of the angle of the wall. As mentioned, traditional belief holds that the toe should be parallel to the pastern angle, but, on a correctly trimmed hoof, this is all an illusion. When you look at the hoof, and the toe and pastern appear to be parallel, the angle of the hoof wall is actually a couple of degrees less than the angle of the pastern. If the wall is measured at 45 degrees, for example, the pastern will be 47 to 49 degrees. It is the fleshiness of the pastern that creates the appearance of a parallel line. 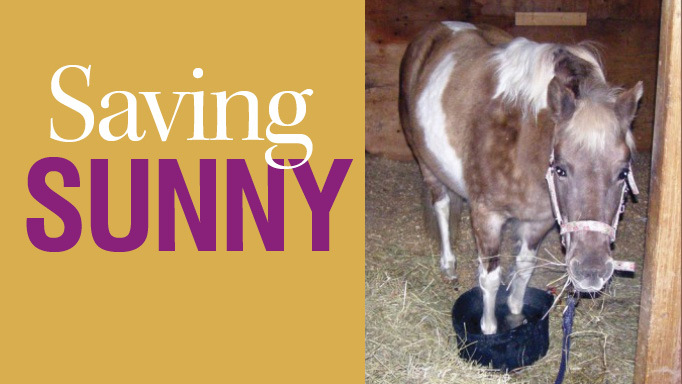 It is an unsound horse whose pastern is 45 degrees or less, when accompanied by a 45-degree hoof angle. The angle of the pastern is variable in that as the hoof angle is decreased, the pastern angle is raised to a position where the cannon bone is directly over top of the back half of the hoof. This allows the horse to actually stand ‘on’ his hoof and bear weight via the digital cushion. The angle of the joint surface of both the coffin bone and navicular bone can bear weight comfortably and allow for a full range of motion without overextension of the ligaments or tendons. This has a great deal of influence on the posture of the horse. It sets the horse on its toes, similar to someone standing at attention and being ready to step off without the need to shift their weight forward to transition from rest to motion. This allows for crisp and snappy departures as well smooth transitions. Conversely, as the hoof angle is increased, the pastern angle becomes more horizontal. A horizontal pastern angle causes the fetlock joint to sag with too much tension in the stay apparatus (which is comprised of the suspensory and check ligaments, and is designed to keep a horse upright) behind the frog, resulting in too much tension, thereby creating the appearance that the heels are too low) photo right . This increase in the tension in the connective tissue leads to the subsequent destruction of soft tissue. Regardless as to whether the horse is barefoot or shod, several features are deemed to be acceptable and others are not, when it comes to hoof angles. A correctly trimmed hoof should feature each of the following favourable attributes, and none of the unfavourable ones. Acceptable: If one drops a descending vertical line from the front edge of the cannon bone, there must be hoof directly underneath it. Ideally, the hoof should be far enough back in the stance that a vertical line descending from the back edge of the cannon bone falls at a point where it meets in line with the apex of the heel, which, on a properly trimmed hoof, coincides with the widest point of the frog. Unacceptable: If the cannon bone does not physically have any hoof directly underneath it, the resulting posture is the equivalent to standing on the rung of a ladder or on a step with no support for the bone column. This places the entire responsibility for holding the horse up on the muscles and ligaments/tendons, and, ultimately, leads to the fatigue and subsequent destruction of soft tissue. Acceptable: The line descending vertically from the front of the cannon bone must fall through the hoof joint (approximately the centre of the hoof), allowing the horse to stand in equilibrium. This means that all the muscles, tendons and ligaments are under minimum strain. The vertical load is then borne equally by all parts of the limb, from the scapular hinge, right through the carpus, and down to the ground surface of the hoof. The heels can then lift off at the same time as the carpus unlocks, and the pastern can then immediately go from rest to seamless break over. Unacceptable: The hoof joint is front of the cannon bone. This results in all manner of posture, as well as movement issues. 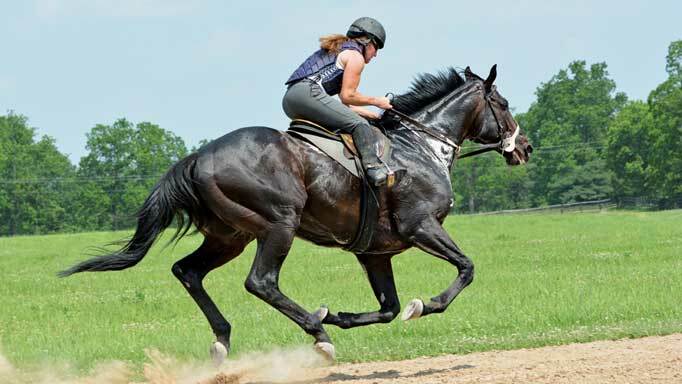 The horse will begin to move forward, yet the pastern must first rise up and pass over top of the hoof before the heels can begin to leave the ground and initiate a stride. Acceptable: The ergot is in the centre of the bulbs of the heels. This means that, viewed from behind, the hoof and the heels do not appear to be aimed or twisted in different directions. Unacceptable: If the ergot appears to be off to one side, there is a twist in the way the hoof lands and loads. This produces counter rotation of the limb, and leads to a number of problems – i.e. tripping, stumbling, interference, heel pain and so forth. Acceptable: The hoof wall, when viewed from the front, is on an even slope, both medially and laterally. The pastern should be centred at the hoof head, much the same as you would view a hand held bell with the handle straight up in the middle of it. Unacceptable: The pastern is skewed off to one side and either the medial or lateral wall is significantly more upright than its counterpart, thereby looking like a bell that has had its handle knocked to one side This produces point loads on the more upright side and can be a source of bruising and hoof abscesses. This will lead to interference problems and issues with lead departures and changes may be present. Acceptable: The coronary band is at right angles to the hoof and pastern. Unacceptable: The coronary band is on a plane that is more horizontal than a right angle of hoof to pastern. This causes heaviness on the forehand and blocks crisp and snappy departures as well as causes strain on connective tissues and can lead to sub luxation of the pastern. 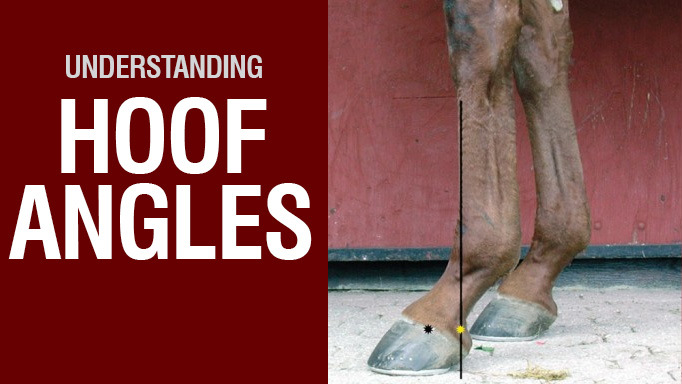 Understanding the mechanics of hoof angles will help you make more informed decisions when it comes to your horse’s hoof care, resulting in better posture and performance. What's in your farrier's tool kit?